Get to Route 17, either from Augusta by crossing the "high" bridge or from Gardiner (Exit 49 on I-295, Then Route 201 into town, cross the Kennebec, then follow Route 226). Once on Route 17, travel east. After driving about 10 miles you will get to Route 32. Turn LEFT on Route 32 and the fairgrounds are just about 1/4 mile north. Stay on Route 1 until you get to Waldoboro and the intersection of Route 32. Turn north on Route 32, continue through Jefferson and on up to where Route 32 joins Route 17, about 13 miles. Turn LEFT (west) and continue for about 4 miles to where Route 32 turns north. The fairgrounds are just about 1/4 mile north. Drive down I-95, exit 109 at Augusta, Western Avenue, and follow the instructions above. Or I-95 Exit 130 at the Memorial Bridge in Waterville and get yourself over to Route 32. 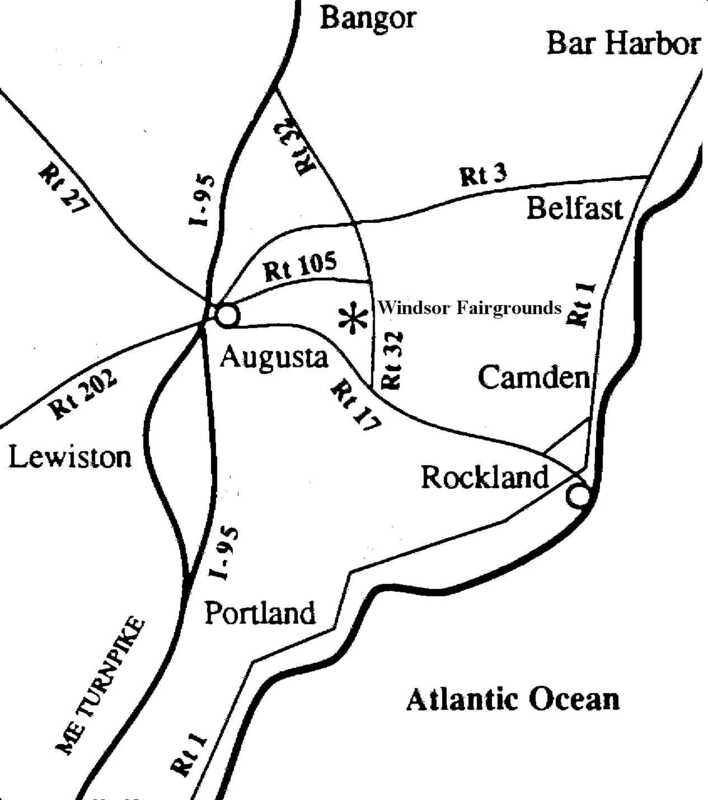 Drive South through Windsor (Hussey's) and the fairgrounds will appear just before you arrive at Route 17. Look for "Windsor Fairgrounds" on the map.